If you've toyed with the idea of picking up this terrific bundle, then now's the perfect time to take the plunge. Splendid sound quality. Well designed saturation plug-in. Super-flexible autopanner. Sensible new preset management. Extended parameters for tweakers. Analogue mode on some plug-ins. Those who buy the SoundToys effects invariably love them, but at $495 for the native package, it's not an investment to be undertaken lightly. However, with two new plug-ins included and no price increase, v4 is already looking far more attractive than v3. 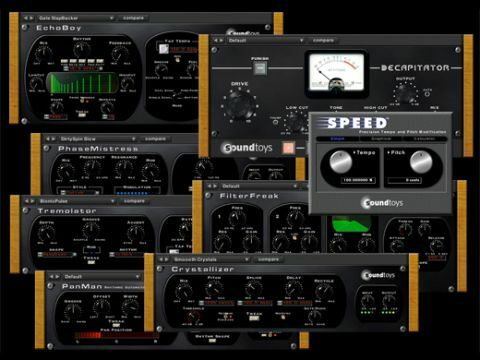 Previously, the bundle included five core effects: Echoboy, Tremolator, Crystallizer, FilterFreak and PhaseMistress. Pro Tools users also benefited from the Speed timestretch plug-in, with its algorithm also available in Logic's Time and Pitch Machine. And TDM users could enjoy a further three legacy effects: SoundBlender, PitchDoctor and PurePitch. The pre-existing effects haven't changed, so we won't cover them in depth here, but you can read the SoundToys v3 review if you want to find out what we make of them. Overall, the plug-ins lean towards time/pitch effects, with a large slice of vintage flavour thrown in. Whether you want tape-type echo, rich analogue chorus, swirling pedal phase or rhythmic stereo filtering, it's all in there. And with an abundance of presets and simple parameters, you can produce both subtle and crazy effects with ease. Possibly the most interesting of the lot is Crystallizer, which yields all manner of harmoniser-influenced weirdness. On the simplicity front, PanMan's five modes - LFO, Rhythm Step, Rhythm Shape, Random and Triggered (PingPong and Random Step) - enable you to set up either tempo synced or free-running autopans in a jiffy. And with simple global controls (offset, width and smoothing) and a hardware-style position meter, you've got quick control and visual feedback. That, however, is only the tip of the iceberg. For the first three modes, the Tweak button opens the envelope/gate panel, where you'll find level-dependent methods of further modulating the offset, width and, in LFO mode, panning rate. This turns PanMan into a dynamic effect that reacts to the level of the signal - going past the threshold provides more modulation. By contrast, in the two triggered modes, when the threshold is exceeded, the signal is panned to a new position. Here, the Tweak option opens up the trigger filter page, where you can fine-tune and monitor the trigger signal. This sort of flexibility can seem daunting, but we found creating dynamic effects a doddle and were particularly taken with the idea of panning that becomes wider as the signal level increases. PanMan has one last trick up its sleeve and that's the option to effectively move signals 'beyond' the speakers (up to 105 degrees either side). This can be used either to create ultra-wide sounds, as with most stereo width processors, or simply to pan sounds past the usual limits of the speakers, which is less common and a great way to add extra space to busy mixes. The brutally-monikered Decapitator stands as a bit of a departure for SoundToys, being a saturation plug-in. Sure, some of the SoundToys plug-ins have an analogue mode, but this is in a different league altogether. Controls-wise, you get input drive level, output trim (with optional auto gain compensation), output wet/dry and three EQ parameters (tone, variable low-cut and variable high-cut) to shape the sound. Note that the low-cut and tone controls affect the pre-saturation signal, whereas the high-cut is post-saturation. Further options include a steep setting for the high-cut filter (30dB rather than 6dB/octave) and Thump, which emphasises the cutoff point of the low-cut filter, described as adding a tape-esque thud to your sounds. Rounding things off is the Punish button - this piles on a hefty 20dB of input gain. There are five saturation modes, and hardware heads will be thrilled to learn that these are modelled on an Ampex 350 tape recorder preamp (mode A), Chandler EMI TG Channel (E), Neve 1057 input channel (N) and Thermionic Culture's Culture Vulture in triode (T) and pentode (P) settings. This results in five distinct effects, from the fizzy edge of styles N and A to the warmth of T, surprising openness of E and more destructive P. However, these effects change dramatically with increased drive, and we found that flipping the Punish button and pushing each to the limit produced the most destructive sound in mode E - not what we expected after use at more moderate levels. Decapitator can do anything from subtle drive - for warming up an electric piano, say - to sucking saturation that's perfectly suited to drum subgroups. It really sounds excellent and, what's more, it's not a CPU hog. You can easily get by with only using the main parameters on the SoundToys plug-ins, but it's worth investigating the extended and hidden parameters. FilterFreak, PhaseMistress, Tremolator and now PanMan all feature a switch labelled Analog Mode. This brings in an additional saturation stage and includes a number of preset styles: Clean, Fat, Squash, Dirt, Crunch, Shred and Pump. There's no actual level control, so the effect is driven by the prevailing signal level, and you'll also notice an increase in CPU hit, but it all adds to the analogue flavour that SoundToys is renowned for. The other main extras are accessed via localised Edit or Tweak buttons that open separate floating windows within the plug-in. Options here are plug-in- or even mode-specific (such as in PanMan, as explained earlier). Some of the most impressive options are found in the LFO and rhythm modes of FilterFreak. In the first instance, you can use the LFO shape editor to design your own wave shape. Similarly, in rhythm mode, in addition to various preset rhythms, you can open the custom rhythm editor to create your own. For those who want it, there's a great deal of power here. At $99, the v4 upgrade is great value, though we doubt existing users will need much persuasion given the quality of the new plug-ins. For newcomers, the variety afforded by PanMan and Decapitator and zero price increase make the bundle more attractive than ever. Rhodes piano riff: flat then with A type saturation just to add subtle edge. Then switching through the other styles E, N, T and P bypassing in between each. Then back to A and push gain, trying low cut then with thump, then some tone control and some high cut. Then adding punish, and pushing up drive, finally blending the mix control back down to taste. Drum kit room mic: first soloing the stereo room mic then adding a medium amount of drive to add saturation. Next modifying the low cut adding some thump and then trying various tone positions finally easing back the top end. Switching through the five styles, then returning to E and pushing the drive right up finally adding the punish option and pushing the sound completely over the edge. Finishing up by modifying the tone controls and filters to fine tune. To demonstrate the dynamic potential, first we treat a simple Rhodes part with a narrow rhythmic autopan. Next we set the pan width modulation to 'widen' and lower the threshold until we start to get a wider pan on peaks. Further lowering of the threshold results in it happening more easily and we also try a bit of offset to the right as well. Finally, easing up the threshold to return to the original setting.